I can’t technically say these are the BEST Sydney anchorages, because we didn’t try them all. But after discussing with our cruising friends and locals, we are pretty confident in saying that these two anchorages in the Sydney area are GREAT anchorages and should not be missed. We had a particular challenge because we had David’s family coming to visit for three weeks. We needed a place close to central Sydney so we could be tourists and a place to leave our boat for three days while we all flew up to Brisbane between Christmas and New Year’s. Lastly, stocking the boat up with supplies for six people meant I needed great access to provisioning. Our first stop was Manly, which is on the north shore of Sydney Harbour, right inside the entrance. It’s a great place to stage for leaving or a first stop since it’s so easy to get to from the entrance. New South Wales provides free courtesy mooring balls throughout NSW, just look for the pink beehive buoys. However, Sydney Harbour only has a few scattered throughout – one here, two there – EXCEPT for Manly. 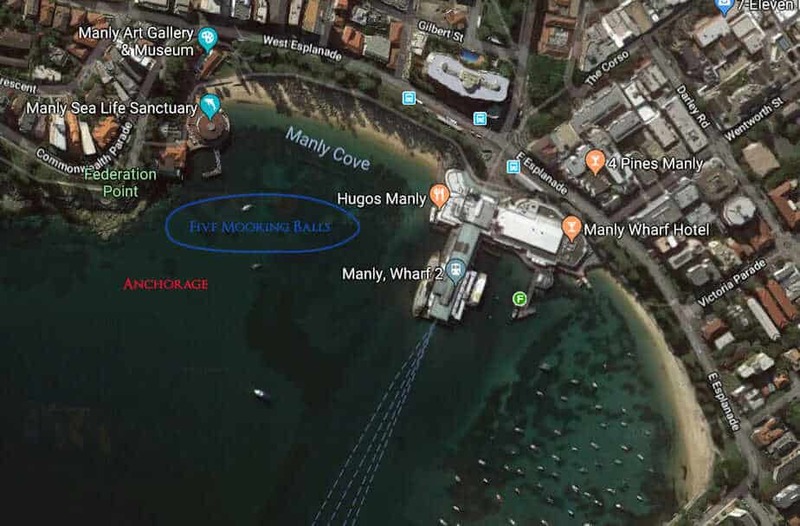 Manly, for some reason, has FIVE courtesy mooring balls, which means you have a much better chance of finding one free. Technically, the moorings are only for 24 hour use, but our understanding is that no one makes a fuss. In fact, someone’s dinghy was on one of the mooring balls when we arrived and was there for over 24 hours. That’s NOT cool. We didn’t pick up a mooring and instead choose to anchor just south of the mooring balls. The passing ferries do wake this anchorage. The further in to shore you are, the less you will get waked, as the ferries create less wake in docking and departing. There are lots of docks around for pick up and drop off points. We left our dinghy tied underneath the smaller wharf. There are multiple ladders going up, and the wharf is very tall, so you don’t have to worry about your dinghy getting squashed underneath the dock. There is a nice Aldi in the Manly Wharf. A short walking distance away is Cole’s, various bakeries, and butchers. The Manly Fresh Produce Market is Wednesday and Sunday. The Manly Ferry is the best way to get into Sydney CBD. It’s a short ride (20 minutes) for cheap (less than $10). There is also a bus system on the North Shore to get you around. Manly is a very popular destination during the summer and has the feel of a surfside town. The Corso is a pedestrian street full of surf shops and ice cream stands. 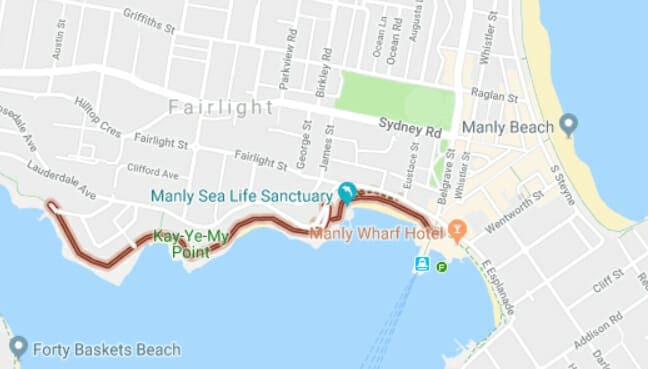 It’s hard to walk around in Manly without taking the Corso, as it cuts through the narrow isthmus of Manly from Manly Cove to Manly Beach. The city ferries are one of the top activities (#4 according to TripAdvisor) in all of Sydney, and getting out on the water without having to navigate for yourself is pretty stellar. Plus, the ferry comes into Circular Quay, and gives you a great view of the Sydney Opera House and Sydney Harbour Bridge. TripAdvisor rates Manly Beach as the #11 Sydney activity. It’s definitely an interesting place to people watch, as the beaches are crowded during the summer. We walked from Manly Beach down to Shelly Beach, along the Marine Parade Walkway. There are marine-inspired sculptures and we even got to spot some water dragons out sunning. The Fairlight walk runs west from the Manly Wharf, and supposedly you can see penguins there. Apparently, before we arrived there was an incident with a dog and the penguins, and no one had sighted the penguins for a while. But, even without the penguins, the walk is very nice. We saw (and heard!) kookaburras and cockatoos. Manly wharf, looking out at the anchorage. Two things we didn’t do, but sound amazing, are the hike out to North Head and the Collins Flat Beach waterfall. North Head has stunning views of Sydney and the coast, plus you can stop at several beaches along the way. For additional reading about the Collins Flat Waterfall, check out this article on Five Waterfalls Near Sydney. Watching the twilight races from the deck. We anchored in Blackwattle Bay for nearly three weeks. #3 is very shallow and has an unmarked sandbar across the middle. Catamarans can anchor either in front of or behind the sandbar, but we ran aground on the sandbar (it’s soft, thankfully). Our final anchoring spot was #1. Please note that holding in any of these places can be tricky. The winds really blew, and a neighbor dragged while we were there. We’ve also heard several stories of other boats dragging. It’s not to be taken lightly! All three anchorages are marked by buoys and signs. They are very narrow anchorages – it is hard to anchor there with enough room to swing 360 degrees around and stay in the anchorage. In fact, most people don’t seem to care too much about going outside of the designated area. However, it is shallow at about 15′, so that’s a plus. We have heard that the holding is terrible, but we didn’t have any issues (other than getting too close to one of the buoys – again, some people didn’t seem to care about that though). As with any public dock, you want to lock your dinghy out of the way of traffic. A 6-minute walk from the Rozelle Bay Public Pontoon is the Tramsheds. The former Rozelle Tram Depot now houses upscale and trendy restaurants, a bulk health food store, a pharmacy, a bottle shop, and a large Supamart. Basically, anything you need is here but might have a heftier price tag. An 8-minute walk from the Blackwattle Bay Public Dock brings you to Glebe Point Road. The 1.5 km of Glebe Point Road between Cook Street and Broadway is full of grocers, butchers, and bakeries to get you everything you need. The grocers may look small, but the selection inside the shops are amazing. I particularly liked Galluzzo, which has a bakery full of Italian treats, a deli with a refrigerated cheese room, and a grocer with fruits & veggies. Also, Glebe Markets are every Saturday with crafts, live music, and food trucks. At the end (south) side of Glebe Point Road is the Broadway Mall. With a Target, Kmart, Cole’s, and an Aldi, you can get anything you need here. The food court is incredibly diverse and we even got to see a movie at the Hoyts Cinema. Finally, with as little walking as possible, docking at the Sydney Fish Market (#4) gives you access to the stalls at the Fish Market, with bakeries, seafood stalls, a butcher, and delis. Can’t find what you need there? Check out the Supa IGA just a few minutes away. In between docks #1 and #2 is Cook Street, which is a dead end road where we often had an Uber pick us up. Easy access to the Light Right is at Glebe Station or Jubilee Park. Bus stops run all along Glebe Point Road. The dock at the Sydney Fish Market gives you walking access to Pyrmont, Darling Harbour, the Star Casino, and Chinatown. Sydney’s easy public transit system gets you access to further afield. 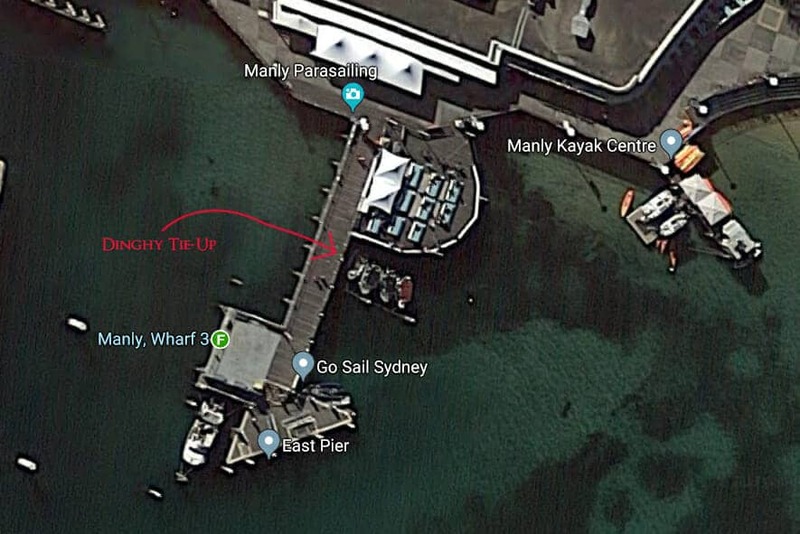 Click here for the NSW map of Sydney Bay moorings, which shows were courtesy moorings and private moorings are located, as well as the Sydney anchorages. Not sure where you are now? 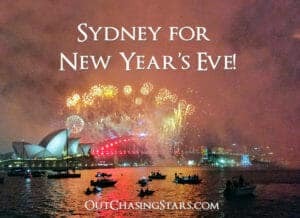 If you are still in Sydney Harbour, Australia Day (Friday 26 January) is spectacular on the harbour. My wife and I cruised the East Coast of Austalia in our catamaran “Blue Magic” in 2006. We sailed from Gosford / Broken Bay (~30nm north of Sydney) to Cairns and back. We are up in the Gold Coast area now. Thanks for the link to your blog, I will check it out! Its so weird reading you talk about places so familiar to me after seeing you write about other far away places around the world. As I said on facebook my old apartment was on the second floor of the beige apartments near anchor spot 1. Guys, you had me scratching my head with Quay Circle! Then I realised you were talking about Circular Quay. Whoops! My bad, good catch. Fixed it! Great post, but I’d like to share that the #3 anchor spot mentioned above has a notoriously poor hold. 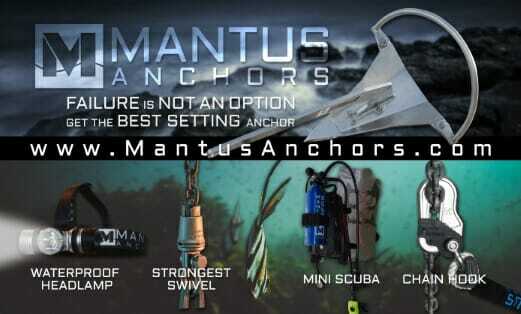 Our anchor dragged there putting our Lagoon catamaran on the rocks in light wind. Do not anchor here!!! Thanks for pointing that out. Just heard about another boat dragging there today!